Dudley J. Hughes ’51, legendary oilman, author, scientist, soldier, philanthropist and loyal Texas A&M alumnus, passed away April 21, the day of Muster, where Aggies gather the world over to remember those who have gone before. Aggie Muster is a time-honored celebration of those who have served and set the stage for Texas A&M's University current and future success. “Knowing Dudley’s love for Texas A&M,” said Carlos Dengo, director of the Berg-Hughes Center and long-time friend, “I am sure he would have appreciated the coincidence. Dudley Hughes, along with his twin brother, Dan, came to Texas A&M from their hometown in Palestine, Texas. They both majored in geology and, after graduation, they both joined the Union Producing Co. before being called for active duty to serve during the Korean War. After the war, Dudley rejoined Union Producing before founding Hughes & Hughes with his brother. Over his 40-year career Hughes was a highly accomplished independent oil producer and philanthropist, owning and operating more than 10 different oil and gas companies. He was a member of the All American Wildcatters, an elite group of 100 members, and recipient of the American Association of Petroleum Geologists’ Outstanding Explorer Award. He also received lifetime achievement awards from several state and national organizations, including Philanthropist of the Year from the state of Mississippi. In addition to dozens of technical papers related to the oil and gas industry, Hughes is author of Korean War Experience, The Wall of Fire: A Diary of the Third Korean Winter Campaign (2003), and Oil in the Deep South: A History of the Oil Business in Mississippi, Alabama, and Florida, 1859–1945, published in 1993. 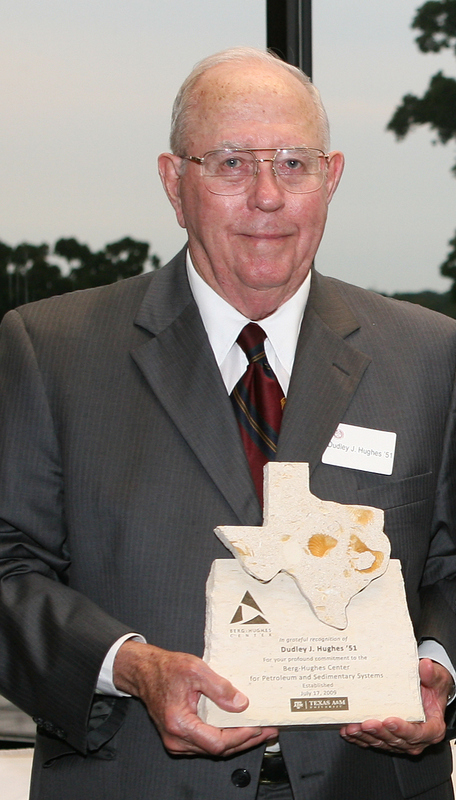 At Texas A&M, Hughes was awarded the Sterling C. Evans Medal, the Texas A&M Foundation’s highest honor. He was named a Distinguished Alumnus by the Texas A&M Association of Former Students in 2010. Hughes and his wife, Robbie, created the Dudley J. Hughes ’51 Chair in Geology and Geophysics, and he contributed to the Robert R. Berg Professorship in Geology and the William R. Bryant Oceanography Chair for Teaching, Research and Mentoring Excellence. He was a lead contributor in the endowment of the Berg-Hughes Center for Petroleum and Sedimentary Systems. Hughes is survived by his wife, Robbie Watson Hughes, daughters and sons-in-law, Vikki Hughes Johnson (Price) and Cindy Hughes Meehl (Brian), five grandchildren and two great-grandchildren. Surviving Hughes family members his twin sisters, Beverly June Hughes Ainsworth and Barbara Jane Hughes Christian, brother Dan A. Hughes ’51, and nephew Dan A. Hughes Jr. ’80, also founding members of the Berg-Hughes Center.